This is just a quickie project from yesterday, before we did Dino Island. 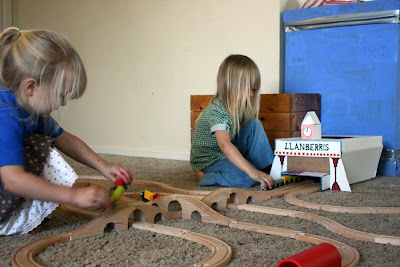 My kids wanted a station for their trains to pull into and I'm not about to spend 50 to 100 buckeroos on a Thomas the tank engine wooden one, as lovely as they are, so temporary, home made from recycling and kid decorated was the way we went (as I'm sure you're used to by now if you've been with us very long). 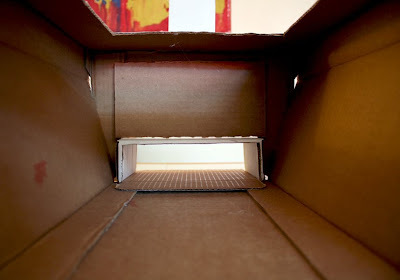 I picked up some cardboard boxes of various sizes that were plain white from the disgarded box bin at Costco last time we were there. Actually, I climbed into the bin to reach them. I have no shame. With just a little bit of glue gunning and a few strategic exacto knife cuts three of those boxes made a reasonably convincing station. 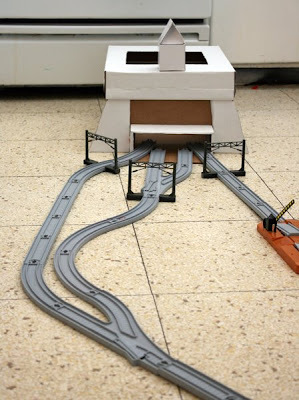 They played for a while with the plastic Daiso tracks on the kitchen floor before deciding that it needed to be embellished. 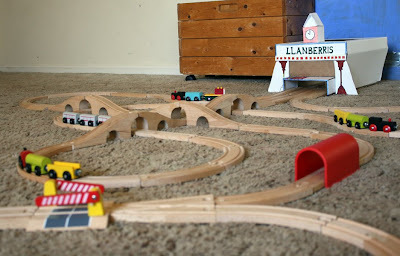 We decided to name it after the station near where the grandparents live, that we visited on our vacation last month. 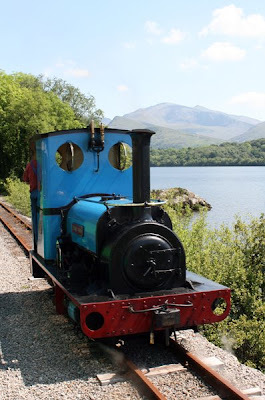 It's a place in Snowdonia in North Wales where you can ride on a narrow gauge railway that was once used in the slate mining industry years ago. 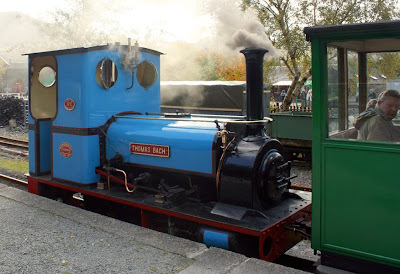 The kids were so excited that the train that pulled us was painted blue and called "Thomas Bach", which means "Little Thomas" in Welsh. 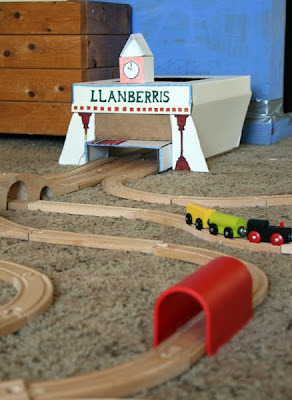 The place is called Llanberis, and here are a couple of pics of the real station there (nothing like the cardboard one we made mind you) I am embarrassed to say that when writing the name on the cardboard station with a sharpie, I didn't check the spelling first and managed to put an extra R in there. Bah! Never mind. My spelling and grammar are be carp. My oldest daughter, who is four did most of the colouring, but my younger daughter, who is three had a scribble on one of the sides too. 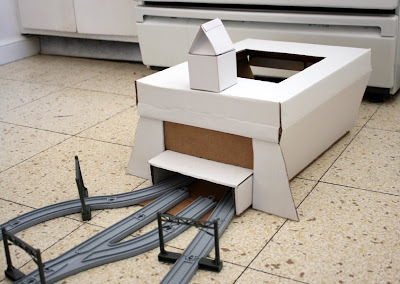 They managed to get four tracks going into the station with our mismatched collection of Ikea wooden tracks and Daiso wooden tracks. 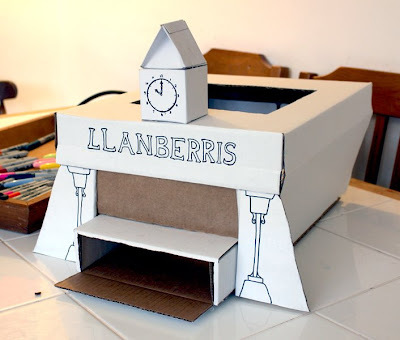 I don't know how long it'll last, but when we're done it'll just go back in the recycling and we can make another freebie station from more boxes, with a different design. T wants to know if yo were a Art Director or Production Designer in your pre-mama days?! I agree with Amber: you are amazing! 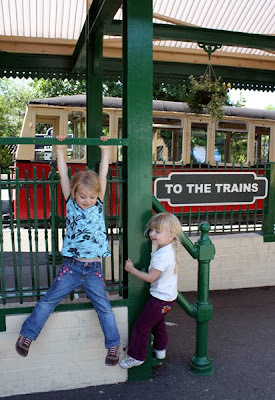 I am so happy to have found your site this week ... a bit nervous to be honest since my 4 yo was quite taken by the dinosaur setup and now has a list of 3 other places we "have to make." Amber! 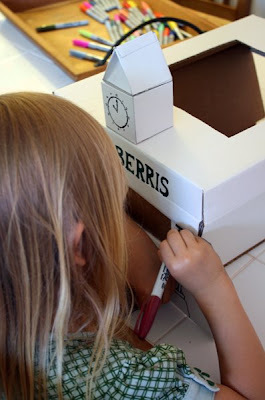 I'm very excited that you are making a cardboard rocket ship too! Please please let us have a peek at it when it's done. 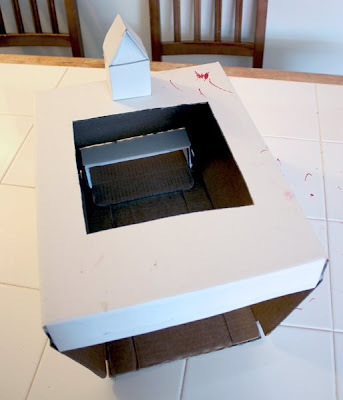 I love seeing people make the stuff we do on this blog! My kids would think it was very cool to see too, especially as ours became one with the recycling again a few weeks ago. Catherine, that's so cool that your 4yo has so many ideas for potencial creations! As I've said to other people that comment, if you do make something cool, please come back and tell us about it! If people want to share their pictures of the projects then I might start a Flickr group for people upload to if they want to. I hope it's not just me that loves to see what others have created based on the same theme.